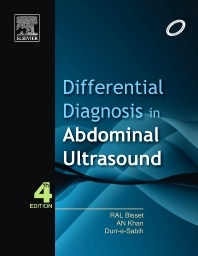 This Fourth Edition of the classic book on Differential Diagnosis in Abdominal Ultrasound is updated and presented in new four color format. Incorporating an extensive list of differential diagnosis, this book provides a comprehensive summary of core knowledge of abdominal ultrasound. It is intended to provide an accessible source of information for radiologists, physicians that practice ultrasound imaging, and sonographers in training and practice. Easy to understand, affordable, concise pocket reference in abdominal ultrasound imaging. Updated text, especially in the chapter on Liver, Biliary System, Pancreas, and Spleen. Includes new chapter on Focused Assessment with Sonography for Trauma (FAST). Addition of new images and improvement of earlier images in all chapters.